March 22, 2019 is World Water Day. Stockholm, Sweden — Every year, the World Economic Forum asks some 1,000 decision-makers from the public sector, business, academia and civil society across the globe to assess the risks facing the world over the decade to come. Since 2012, water crisis has consistently been ranked as one of the threats with the highest potential impact as well as likelihood. This year "water crisis" is named as the risk with the fourth biggest impact. When asked how likely the risks are to occur, "water crisis" is placed as number nine. The top scores on both impact and likelihood are perceived to be: extreme weather events; failure of climate change mitigation nd adaptation; and natural disasters. But wait a minute - what are extreme weather events, poorly managed climate change and natural disasters? Almost always the answer is water. Annual flood losses in Europe are expected to increase fivefold to 2050 and up to 17-fold by 2080. Water doesn't have to create a disaster to be a problem. 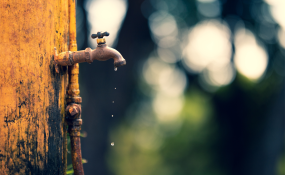 The sheer uncertainty around the future water availability is causing planning problems for cities, businesses and households. Shall we invest in expanding our water supplies or our stormwater drains or both? Should farmers invest in draining or irrigation? Does your home insurance cover both wild fires and mud slides? During last summer's heat wave in Sweden, fans were out of stock almost everywhere, reportedly creating a second-hand market where 50 SEK fans sold for 1,500 SEK. Will fans be the hot item in 2019 as well or will rainwear be the coolest thing around? On closer inspection, 9 of the 10 risks with above average impact and likelihood have clear linkages to water. Apart from the already mentioned, poor water governance too often plays a part in "man-made natural disasters", "large-scale involuntary migration", "interstate conflict" and "failure of regional or global governance", as well as "bio-diversity loss and ecosystem collapse" where populations of freshwater species have declined by an average of 83 per cent over the last fifty years, far more than species on land or in the sea. Firstly, we need to understand that water risks are much more than its absence. Water is used by everyone, everywhere for almost everything. Changes in its availability will have huge impacts on how we live and make a living. Ignoring the increasing water variability is a sure way, both figuratively and literally, to so called "stranded assets" - investments that become obsolete due to events rather than age. We all need to apply the understanding of the role that water plays in our societies to policies and incentives in and by almost every sector and actor. The big question we need to ask is: are our governance structures suited to the current and future realities of water? Are we being guided to use the water that we sustainably can borrow from nature as effectively as we can? And are we sufficiently supported in our efforts to protect our loved ones, our lives and our livelihoods from the less benevolent aspects of water?